"This is a nice and simple cold salad that is nothing more than asparagus dressed in a Chinese-influenced vinaigrette topped with sesame seeds. It's a great way to celebrate the arrival of the asparagus crops!" Whisk together the rice vinegar, red wine vinegar, soy sauce, sugar, and mustard. Drizzle in the peanut oil and sesame oil while whisking vigorously to emulsify. Set aside. Bring a pot of lightly-salted water to a boil. Add the asparagus to the water and cook 3 to 5 minutes until just tender, but still mostly firm. Remove and rinse under cold water to stop from cooking any further. Place the asparagus in a large bowl and drizzle the dressing over the asparagus. Toss until evenly coated. Sprinkle with sesame seeds to serve. Fried pastrami strips and a simple mustard dressing are perfect with asparagus. Made this again today. Due to a soy issue, I used Worcestershire in its place. It's still good. I've also used fish sauce which freaks some people out unless they aren't told before they eat it. Very good, and simple for hot summer days when you don't want to eat something hot and don't want to work too hard! You can easily substitute green beans for the asparagus. Yum! I didn't have peanut oil, so I just used olive oil. 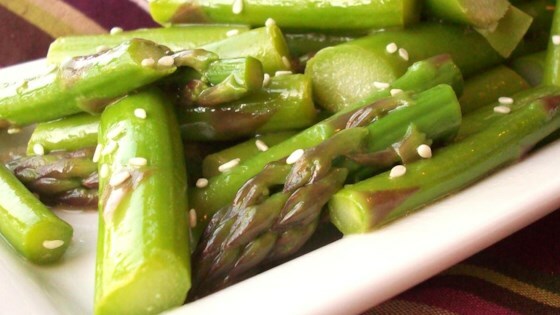 Lots of flavor and a great way to serve asparagus. Thanks!